A tasty filo pastry with a delicious vegetable twist is a perfect option for a fancy brunch or a simple and healthy snack. 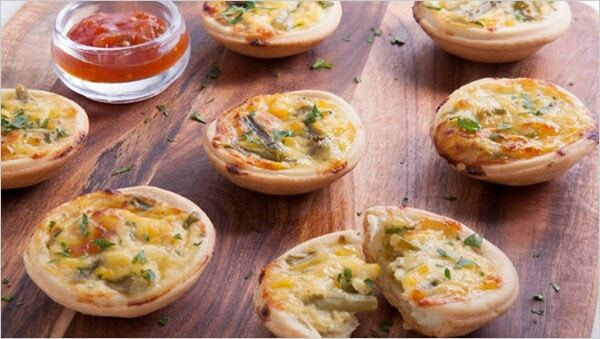 These tasty little bites are based on one of the world’s healthiest ingredient – asparagus. It’s loaded with different nutrients and a perfect way to start your day! Enjoy! Lightly spray one sheet pastry with cooking oil and place second sheet on top and spray. Fold in half and then cut into two and fold in half again = 8 thicknesses. Repeat with remaining pastry. Gently press prepared pastry sheets into each cup of a six cup large muffin pan. In a large bowl, combine corn kernels, asparagus cuts and tips, cheese, eggs, mustard, light sour cream and red capsicum. Season with pepper. Spoon mixture evenly into pastry cases. Bake in a pre heated oven at 200C for 20-25 minutes. Serve warm or cold. Serves 6.